Happy Snow Day from Maine! It's been a crazy winter so far...with far below average snowfall and incredibly warmer temps. I'm not complaining at all. Winter is my least favorite season. But I DO love snow days! We started out this week with 50 days. 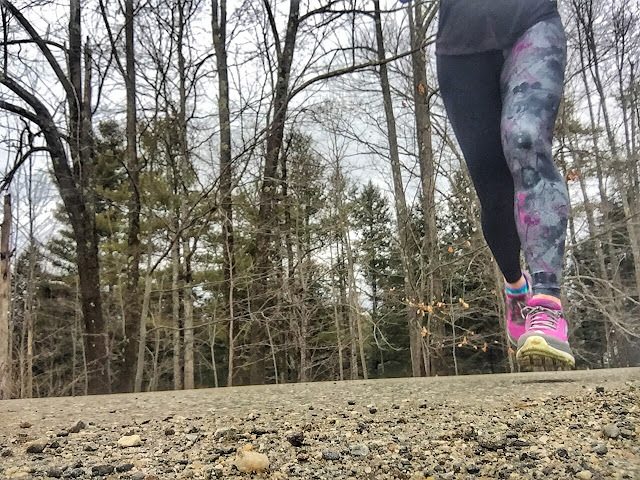 Which made for great running in shorts weather...and a chance for me to run outside in my *custom* Spandits shorts with ProCompression Marathon socks. I'm addicted to this look.... fun Spandits prints and knee high ProCompression socks... LOVE! The later in the week, my newest *custom* Spandits arrived. That is some serious fun! I love how the ladies at Spandits added black to their spandex choices - black with a fun print really spices things up. Have I told you I love Spandits? Perhaps once or twice. I recently was selected to be a Tasc Performance Ambassador. I am to the moon and back excited by this. If you don't know about Tasc, you seriously need to check out their new website and check out their clothing lines! 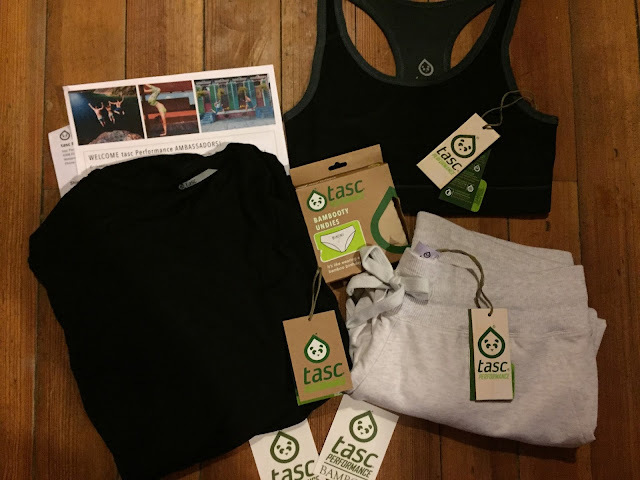 Tasc Performance makes clothing for men and women made from Bamboo that is amazingly soft and comfortable AND it won't stink up. Ward doesn't know this yet.... but I will have to swap out all of his clothing with Tasc Performance because he's always blaming his stink on his clothes. Read the Tasc story here. And while you are there, do some shopping and use my 15% off family and friends discount code FF0103-hjA6 (good through 3/31/16). Featured here: Tasc Performance Elevation Hoodie ($120) and Tasc Performance Riverwalk Pants ($68). The shirt is beyond adorable - hoodie, thumb holes and quite flattering. I didn't want to take it off. Is that bad? I need to seriously organize everything. I've kind of let go of my organizational skills at home (classroom is one thing!). I was keeping my ProCompression collection *addiction* in a basket. But it started overflowing. Then I would lose a sock. Or it would overflow. But then the other day I had a brainstorm and bought this over the door organizer for a whopping $7.50 on Amazon (not an Amazon affiliate...for some reason that's not allowed in Maine. Boo.). I could seriously organize so many things in this organizer.... ProCompression socks, Spandits, shoes, accessories... you name it! I thought I would stop here with my own closet door - otherwise we would see these organizers behind every single door in my house. Ward might now like it. I cannot wait to fill that hole right above here.... my newest Valentine socks are on their way!!!! Oh wait, the mail truck just drove up. Darn....denied again. Maybe tomorrow? Positive Thinking. It's a Powerful thing. We have been super fortunate to have a lot of family and friends who care for our family. Though the power of positive thinking and lots of prayers and love, I feel their strength has helped us get through these difficult times. I strongly believe I have the most resilient son ever. Given all of the surgeries he has been through since last April, I am amazed at his strength and courage. He has taken all of the appointments and poking/prodding with ease. When I find myself getting all worked up in a huge tizzy, I look at him and see the calmness and strength, and I'm centered once again. My Momentum Jewelry bracelets have added quite a bit to my daily positive thinking each day as well. Each day, I pull them out and choose one or two that I feel meet my daily needs/goal for the day and all I need to do is look down at my wrist and read these motivational sayings and I stronger and ready to deal with what comes my way. Last week he had his skin graft and this week the bandages came off. For the first time we had the chance to see the amount of tissue that needed to be removed due to the awful doctors we had before we finally found Dr. Taghinia at Children's Hospital in Boston. Thankfully Tucker (and us) are in excellent hands now and I believe we are on the road to recovery.